Looking for a T-shirt Quilt Maker? Several times this past week, I've heard the comment "oh, I'm so glad you are local, I wouldn't want to put my tshirts in the mail". While, we are fortunate to live outside of a huge metro area (Houston), I cringe a bit on the inside when hearing that. There are actually two issues here. Trusting the Post Office and not knowing anything about the t-shirt quilt maker. We have been making T-Shirt quilts since 2006. We have not had a box of tshirts (or the returning quilt) get lost. 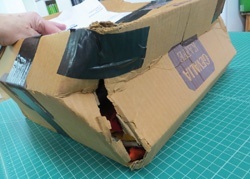 With today's technology providing detailed package tracking, it would be a rare occurrence for a package to go awry. (Now, we have received boxes that were meant for other quilt makers - oops! ) Read about what to expect after ordering your T-Shirt Quilt. Use a printed (rather than hand-written) label with the address. Double check the 'ship to' address. Click HERE for printable address label. Use Priority Mail, UPS, Fed-Ex or other service that offers package tracking. Unless your mom or best friend makes T-Shirt quilts for a living, you really don't know who you are turning your tshirts over to. When you drop your shirts off at our shop, we do get a chance to meet for a short time, and you get to look around the shop and look at other quilts in process. Do they have a website? Does it give enough detail to help you make a decision? How many t-shirt quilts have they made? It is not always a bad thing to mail your box of tshirts off to a quilt-maker. There are many companies that have been in business for years and offer a quality product. You should do a thorough internet search and compare. Look at the photo gallery. There should be lots of images of the work they have done. Read through the FAQs, and articles that they write. How much knowledge about making t-shirt quilts do they share? 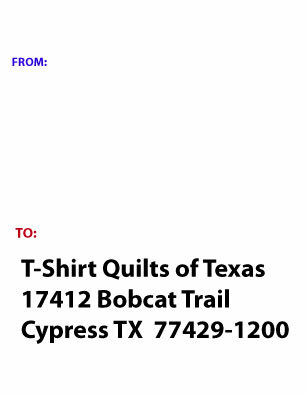 T-Shirt Quilts of Texas** has been in business since 2001 quilting for others. In 2006 we added t-shirt quilts as a natural growth of our business. We have made thousands of t-shirt and memory quilts over the years. We have the experience, knowledge and passion for creating your special quilt. A good number of our customers are repeat customers. Do you have enough information about T-shirt quilts to make a decision about who should make your T-shirt quilt? Before you ask anyone to make your quilt, check out our T-Shirt Quilt Buying guide. It will give you the information you need to be able to ask the right questions of your quilter.